Black Hawk Lock and Key offers 24-hour mobile locksmith service to give fast and trustworthy assistance. Are you facing a locksmith emergency, such as a lockout or a broken key in your ignition, and you need fast help? 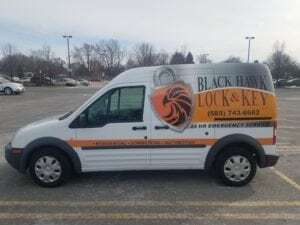 At Black Hawk Lock & Key, our mobile locksmith service comes to you. We are the trusted Henrietta locksmith that residents, businesses, and drivers prefer, providing reliable, on-the-spot solutions that you can trust. If you’re like most people, you don’t research locksmiths before you actually need one. Often by then, you’re in a bind and need quick help, and you may not have the time to look into important things like certifications, licensing, and business standing. Fortunately, we make it easy for you. We are members of 1800unlocks, meaning that we have been screened for professionalism, service, and proper licensing and certifications, and we are listed on the Fair Trade Locksmith Directory. Our locksmiths are licensed and insured, and they’ve received extensive and ongoing training to take care of nearly any job, quickly and without harming your lock. Don’t get lured in by locksmith scams. Many offer low up-front prices, only to jack up your rate and possibly resort to simply breaking your lock, compromising the security of your home, business, or vehicle and potentially costing you a significant amount of time and money. Call the locksmith Henrietta NY residents and businesses trust to provide high-quality service. Whether you want to maximize the safety and security of your home or you want to upgrade the locks on your business, our locksmiths have the knowledge, training, and tools to provide you the best security solution to meet your needs. For assistance with an emergency lockout or to discuss the latest in security technology, contact Black Hawk Lock & Key today. We can meet you wherever you are to provide fast help, as well as ensure that your home or business is secure.